Me and Mine: December is almost over! "Mom, I shot a bid doose!" Whew, what a busy month! It's been a while since I updated my blog so I will try to get caught up. Christmas this year was a hoot. I took two weeks vacation to enjoy the holiday and must say that I have spent every day busily preparing for Christmas, cleaning my house, and getting some much needed R&R. I haven't had much time to scrap until today but I finally got a few pages done that I am pretty proud of. I will upload them as soon as the stickles is dry. I've tried to rush the drying process (not cool) and have ended up with glitter glue all over myself...at least I'm very sparkly today! 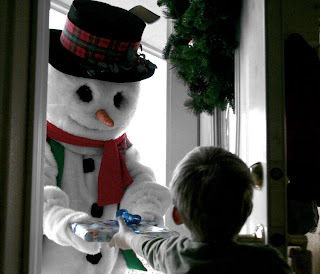 Christmas came for Gabe on the 23rd when Frosty showed up on our doorstep again this year with a gift. Gabe was so excited that all he could say was "srosty the froman!" It took a little bit of coaxing to get him to give Frosty a hug and say thank you but he did it and I got some good pictures. As usual Christmas eve was at mom and dad's house--and boy was it hectic. It's interesting how we all have kids around the same age again. There were 8 little kids running around plus all of the big ones...add that in with all of the adult conversation and you have a pretty loud bunch. The food was awesome and so were the gifts. I had a great time. Since we were heading out to Dufur early the next morning, we opened presents with Jaron, Meg, and Tanner on Christmas Eve. It was really nice to have the boys all together for the holiday. It always makes me a little sad when they go home. Finally, we went to Dan and Nancy's house on Christmas day for dinner and a gift exchange. Unfortunately Dixie was under the weather and wasn't able to make it but everyone else was there. The boys rode the 4-wheelers in the snow and stood around the bonfire outside. Gabe made a haul with all of the gifts this year and even got a new Gator to drive around. Merry Christmas!